In this video I am going to share with you the yoga breath practice I use to fall asleep and get back to sleep. I know what you are thinking, but I´m so anxious, stressed and I can´t calm down because I´m so worried about the next day. I get the same way too and I even think that this breath probably won´t help because I´m so worked up, but it works every time and in the rest of this video I will show you how easy it is. 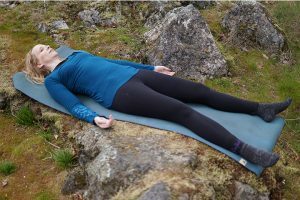 This yoga breathing exercise is so easy that you can do it in bed before you go to sleep or if you wake up in the middle of the night to help you fall asleep. I will take you step by step through this deep breathing and relaxation technique to help you relieve your anxiety and stress for better sleep. It will help you relieve the worries of the day, calm your anxiety and stress before sleep. So let me share with you this yoga breathing technique to help you calm your mind, relieve stress and anxiety so you can fall asleep or get back to sleep when you wake up in the middle of the night. It is super simple and you can do it right in your bed, lying down. Start by placing your hands on your lower belly and just feel your breath coming into your lower belly. We will take a few breaths here and just feel our breath coming into our lower belly. Then we will shift our hands up to our mid chest. Feel your breath coming into your mid chest for a few breaths. Finally move your hands up to your upper chest and feel your breath coming up under collar bones and across to your shoulders. Now we are going to put all three of these things together and this is where the magic comes in. You will breathe into your belly, pause. Then into your ribcage and pause. Finally into your upper chest and pause. Now let your breath fall out of your breath, almost as though you are falling asleep. For me I keep doing this until I fall asleep. I focus on this breath and the feeling of sinking, letting go on the outbreath, letting go of tension, worry and anxiety and getting heavier. Did you know it is completely normal for it to take 20-30 minutes to fall asleep. That is the average time it takes for a human being to fall asleep. So enjoy that time of lying in bed where you have nothing to do, nothing to accomplish, nothing to complete. There is nothing you need to get, nowhere you need to be, and nothing you need to know. You can just relax, let go of the day and take your time entering into the holiday of sleep and dreamscape. This is your time to have a retreat from your waking life. You know how much I love my fabulous finishers, so if you made it all the way to the end of this video put, ¨I am falling asleep¨ in the comments.